Ram Pumps only have two moving parts, making them virtually maintenance-free. Water enters the lower of two chambers through a pipe from an elevated water source. This pipe must be relatively long and thick so that significant force (inertia) is developed as the water moves down it to the chamber. As water rushes in it starts the pump. The chamber fills and the ESCAPE VALVE (on the left here) shuts. The DELIVERY VALVE to the AIR DOME opens. The momentum of the rushing water pushes some water into the air dome and compresses the air that partially fills that chamber. When the pressure is great enough it opposes the force of the incoming water and the second valve drops shut. After the delivery valve shuts, air pressure pushes water up the outlet pipe. In the first chamber, all valves are closed and no water can move, so the escape valve drops open and the cycle begins to repeat, about once a second. This is an ideal pump when a plentiful water source is available. Roughly 3/4's of the water that passes through the system exits via the escape valve. Manufacturers of several non-electric pumping solutions. Atlas Publications published a book by Don. R. Wilson called All About Hydraulic Ram Pumps -- How and Where They Work (ISBN 0-9631526-2-9). It describes how to design, build, and install a simple, efficient hydraulic ram pump. Rife Hydraulic Engine Mfg. Co., Inc. is the manufacturer of the DAVEY ram pump shown above. They have been manufacturing "water pumps and related products" since 1884 and have a wide variety of sizes and models to choose from. Has "been manufacturing rams since 1989"... "The B& L Hydro-Ram is an efficient, lightweight, dependable and inexpensive hydraulic ram pump made possible by modern technology. It works on the same principles of physics that enabled its cumbersome predecessors to water the farmlands of Europe, the Mid-East and Asia over the past two hundred plus years." (They have a lovely animation of a ram pump at their web site!) 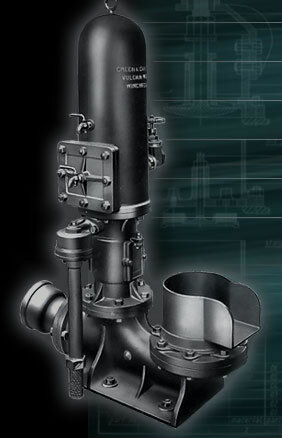 B & L Associated Industries is located in Rusk, TX and ships their pumps worldwide. Donald Burger, collector of Hydraulic Water Rams. Mr. Burger's site contains additional links to other sites with more information about these marvelous pumps. The Vulcan Hydraulic Ram Pump is still their only product -- after more than 200 years. As noted on their web site, they were "the inventors and patentees of the hydraulic ram principle in 1774". Green and Carter now make over 60 varieties of Vulcan Hydraulic Ram Pumps, including models that can pump water to heads of over 1000 feet, with drive pipe sizes of 3/4 of an inch (1.9cm) to 30 inches (76.2cm) (or more to order). According to the Green and Carter web site: "Units are heavily constructed of cast iron and gunmetal. There is no substitute for this material. Imitators use plastics (which are subject to UV degradation), steel (which corrodes) and nylon seals and O-rings which become useless with the slightest wear."